Lusaka based private owned Prime Television faces closure as the Zambian government threatens to revoke it’s broadcasting licence and has since summoned it’s proprietor. The Independent Broadcasting Authority (IBA), a government department that regulates broadcasting has issued the summon. According to a letter by IBA Director General Josephine Mapoma to Chief Executive Officer at Prime Television seen by Zambian Eye, the television management has been summoned to appear before the Authority on Monday, October 9, 2017 at 10:30 hours. 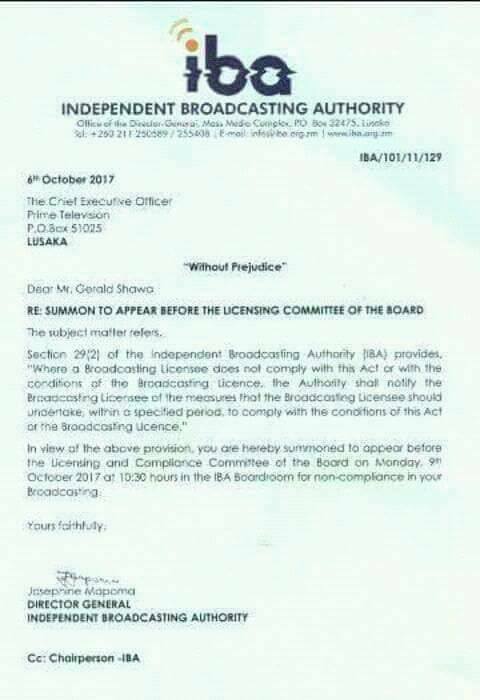 The Television has been accused of violating the provision of the broadcasting 5license and is being summoned according to Section 29 (2). Prime Television two days ago run a story where the opposition UPND Kalulushi parliamentary candidate alleged that he was paid during the 2016 elections to conceal over 12, 000 votes of his president Hakainde Hichilema by PF Candidate Kapamba Mulenga who is now Information Minister. The Television station has also been featuring fired Information Minister Chishimba Kambwili who has been disclosing a number corruption deals in government. Kambwili has charged that President Lungu is corrupt. This according to insiders in PF has not gone well. And Opposition UPND president Hakainde Hichilema has urged IBA not to be used by the ruling Patriotic Front (PF). IBA MUST NEVER BE USED AS AN INSTITUTION TO PERPETUATE INTIMIDATION AND CORRUPTION. We have noted the correspondence by the Independent Broadcasting Authority (IBA) summoning the proprietors of Prime TV for questioning on Monday. Our country has already experienced several media closures and suffocations under the PF and we cannot go on like this. The IBA must distance itself from the PF and it’s suffocation of the media by allowing the fourth estate (Media) to operate independently. We have always insisted that media houses must be allowed to operate freely as part of the democratic process that ensures checks and balances in any country. In the instance of summoning Prime TV owners, we have no doubt the reasons that have led to such and as UPND, we shall issue our findings and demand for answers on certain revelations that have been made recently. But the intimidation of media houses and whistle-blowers must come to an end immediately. We urge IBA which is supposed to be an independent institution not to fall prey to being used as a tool of intimidation and corruption in the country. The guilty are afraid. After stealing elections and clinging to power illegally Lungu and his illegitimate govt is very insecure. The lack of vision on the part of ECL and PF makes matters worse. Its chipante pante all the way. Lungu has no value proposition to Zambians. He is just there and bungling all the time and enriching himself at the expense of masses. Lungu doesn’t even know how to deal with corruption in his govt.He can’t even state his govt’s Policy towards Corruption becoz he is Mr Corruption Number One himself. He cannot hold his Ministers to account becoz he is the most corrupt person.He can’t explain his newly acquired wealth becoz he has been involved in numerous corrupt deals. He is a bad example of a Leader in Zambia. The man simply doesn’t inspire the Nation.With this poor leadership under Lungu’s watch Zambia is doomed.Its crisis after crisis but no direction and no future.Just drifting towards 2021 Elections which he hopes to rig again. Cry the beloved Zambia.